Hermann Hill Vineyard and Inn is an award-winning bed and breakfast in Hermann, Missouri that has been providing guests with a luxurious getaway for over 20 years. Located a mile from Riverfront Park on the Missouri River and just a short walk from the Stone Hill Winery, this elegant inn features luxurious accommodations set in two distinct upscale lodging properties. The River Bluff Cottage Suites and the Vineyard Inn Suites feature comfortable furnishings, whirlpool tubs and fireplaces, kitchens (cottages), and private balconies and patios, some of which have gas grills and outdoor hot tubs. Guests are treated to a delicious farm-style breakfast every morning and cookies and ice cream every evening in the comfort of their suites. Additional guest services include packed picnic lunches on request, along with massages and spa services in the state-of-the-art spa room, drinks by the firepit in the evenings and a range of complimentary concierge services. Hermann Hill Vineyard and Inn features luxurious accommodations set in two distinct upscale lodging properties, namely the River Bluff Cottage Suites and the Vineyard Inn Suites. The River Bluff Cottage Suites feature spacious living rooms with sofas and armchairs, two fireplaces, work desks and chairs, and flat-screen televisions, kitchenettes, and dining areas. Bedrooms have king-size beds dressed in deluxe linens and hypoallergenic pillows, and flat-screen TVS and en-suite bathrooms have steam showers with rainforest shower heads and body sprayers, Jacuzzi tubs, plush towels, bathrobes and slippers, and organic bath products. 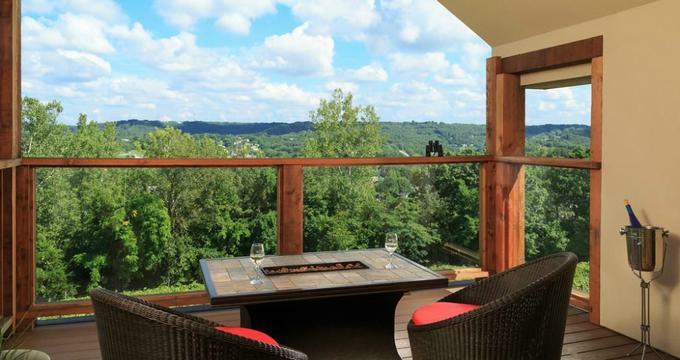 Suites have private decks with hot tubs, gas grills, outdoor furniture and breathtaking views of the Missouri River. Upper-level cottage suites have additional gas stovetops, and one cottage has a pizza oven and a hammock. Modern amenities in the River Bluff Cottage Suites include HDTVs and Blu-Ray/DVD players, iPod docking stations and radio/alarm clocks, mini fridges, coffee makers, ceiling fans, hairdryers, and complimentary wireless Internet. Cottages are stocked with homemade granola, yogurt, sodas and fruit juices. The Vineyard Inn Suites offer romantic solitude and are ideal for couples wanting privacy and seclusion. Luxurious suites have king-size beds dressed in deluxe linens and hypoallergenic pillows, and flat-screen televisions, en-suite bathrooms with Jacuzzi-style whirlpool tubs, steam showers with rainforest shower heads and body sprayers, plush towels, bathrobes and slippers, and organic bath products. Spacious living rooms have sofas and armchairs, fireplaces, work desks and chairs, and flat-screen televisions, and private decks boast spectacular views of the Missouri River. Some suites have indoor hot tubs and infrared saunas, outdoor showers, fire pit tables on a floating deck with beautiful views of the Norton Vineyard. Modern amenities include HDTVs and Blu-Ray/DVD players, iPod docking stations and radio/alarm clocks, mini fridges, coffee makers, ceiling fans, hairdryers, and complimentary wireless Internet. A gourmet farm-style breakfast is offered every morning in the Frank Lloyd Wright inspired dining room, on the outdoor dining deck, in the kitchen overlooking the Norton Vineyard, or in the comfort of the guest rooms and suites. The hearty breakfast menu features a variety of entrées that are served with bacon or sausage, potatoes, fresh fruit, and fresh bread, muffins or toast, along with coffee, tea, and other hot beverages. Hot entrées can include scrambled egg casseroles, Belgian waffles, cheese strata, French toast, frittatas, quiche, and omelets, while continental choices range from Hermann Hill signature granola, cereals, fruit and yogurt parfait, coffee cake and cinnamon toast. Private cottages can be pre-stocked with a selection of specified breakfast items on request, along with snacks and beverages for the day. Deluxe amenities and guest services at the Hermann Hill Vineyard and Inn include a dining deck with a fire pit table, a gas grill and pizza oven, a frozen Margarita machine and appetizer bar, a complimentary welcome tray with cheese and freshly baked bread, and a complimentary gourmet breakfast every morning. Guest trays with gourmet chocolate chip cookies, homemade ice cream and signature Port Chocolate Raspberry sauce are delivered to each room and suite in the evenings. Facilities at the Inn include a storage area for bicycles next to the parking lot, an electric charging station and a guest computer and fax machine for guests to use. There is also a movie and DVD library, a guest kitchen stocked with snacks and beverages, and a variety of concierge services, such as restaurant reservations, tour bookings, and more.